Day 329: A Visit from the Godfather . . . Enjoying good wine can be an expensive hobby – which is why we really, really, really like when we find a good wine on sale. Tonight we opened one more of the bargain wines that Jean found at Twin Liquors in Kyle last weekend. That’s right, we are talking $10 closeout shelf wine – and while sometimes this experiment in frugalness (is there such a word?) backfires, tonight we reaped the benefits of a sale wine tasting really good. After a long and busy week – Brian had a couple of work events and Jean a couple of day drives for work and one night meeting – tonight we decided to just kick back and relax and do a whole lotta nuthin’. Brian fired up the grill and we enjoyed a link of our all-time favorite sausage from Krolczyk’s in Hempstead. Tucked away at an Exxon gas station off the beaten path, Krolczyk’s offers up a great line of processed meats and sausage. We’ve written about this place before and strongly encourage all to stop in for a look-see. Do not let the fact that they sell gas, bait and tackle scare you off. When you open the doors of the market – WOW, WOW, WOW – the smells just jumps out from behind the counter and demands that you take something home. Our favorite is the link sausage and dried beef jerky – spiced up to perfection. Brian and D#1 stopped on way home this past Monday and picked up some goodies for Casa del Vino and a few other special people. Again, stop by next time you are out and about on 290 heading into Houston. So, we digress – back to the wine. 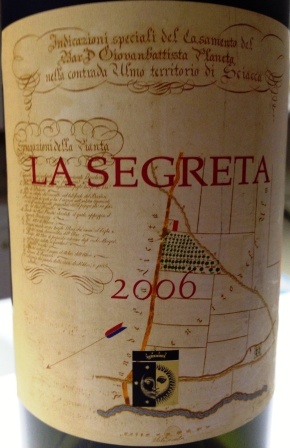 Tonight we popped the cork on a 2006 La Segreta from Sicily. Produced by the Planeta family and not just part of one winery, but many. Since the 1600’s the Planeta family has owned an estate at Sambuca di Sicilia. Here, three enthusiastic young Sicilians – Alessio, Francesca and Santi Planeta – began their winemaking venture in the mid-1980s. Have to be honest, we kept waiting for Vito or Michael Corleone to knock on the door and demand to come in to partake of a glass or two . . . it’s that Italian. The wine itself was very surprising. Initially the color was questionable – a bit of a bronze hue that usually spells trouble for the taster – but given a minute or two, it changed and really turned into a nice deep red (amazing what a little bit of oxygen can do!). An interesting mix of wines – 50% Nero d’Avola, 25% Merlot, 20% Syrah, 5% Cabernet Franc – combined together to create a super glass. On the nose we were greeted with an explosion of fresh fruit – mostly raspberry, cherry and prune – and something else in the spice world caught our sniffers. On the palate we got more berry, especially that raspberry with a warm roasted nutty taste tossed in for good measure. The finish was quite the surprise – a long, smooth taste of chocolate and coffee combined with some acids from the berries made things just darn good. Have to admit, this one was good – just might have to pop up to Kyle and see if there is any more on the “bargain shelf”. So, as we check another week off the list – can it really be July 26? – we wish you good tidings and a fun weekend and as always encourage you to enjoy responsibly and recycle whenever possible. Categories: Uncategorized | Tags: Krolczyck's Meat Market, La Segreta Wines, The Godfather | Permalink.